The location for creating Pictographs was important because the paintings needed to be protected from the elements and erosion. The most common place chosen to create pictographs was in sheltered caves and large alcoves. The pictographs at Canyonlands National Park, Horseshoe Canyon in Utah are located in large alcoves protected from the sun and the rain. The above picture shows the 'Great Gallery' which is an extensive panel of Pictographs which contain depictions of dozens of mysterious, armless figures, up to 10 feet tall. The gallery extends across the canyon walls for over 200 feet. 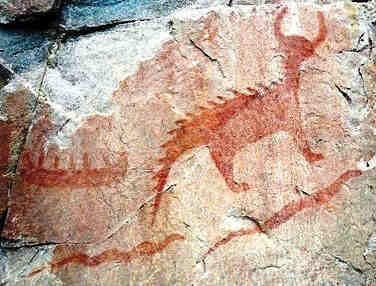 The pictographs have been created on light brown sandstone and painted in various shades of red and brown. The meanings of signs and the types of symbols used by Native American Indians are fully illustrated and can be accessed via the Picture Dictionary of Symbols. 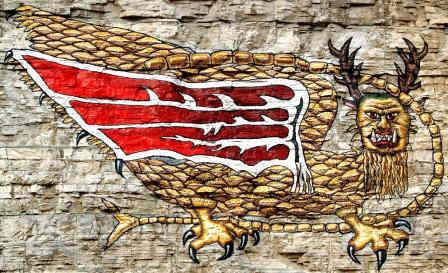 The symbols dictionary provides information and origin of many symbols that are depicted in Pictographs and includes reference to Native American legends and the mythology of the ancient Mound Builders and the fantastic creatures and monsters that featured in their culture. Discover the vast selection of pictures which relate to the History of Native Americans and illustrate many decorations and tattoos used by American Indians. The pictures show the clothing, tattoos, war paint, weapons and decorations of various Native Indian tribes that can be used as a really useful educational history resource for kids and children of all ages and a means to study their interpretation. We have included pictures to accompany the main topic of this section - Interpretation of Symbol. The videos enable fast access to the images, paintings and pictures together with information and many historical facts. All of the articles, such as the Pictographs, can be accessed via the Native Indian Tribes Index.